How to upgrade from Windows 7 Starter edition to Windows 7 Professional on Netbook? Question: I just bought a Netbook computer and it's running Windows 7 Starter edition, and recently I bought Windows 7 Professional and I would like to upgrade Windows 7 Starter edition to Windows 7 Professional on my Netbook computer. My question is, can I do that to take advantage of extra features in Windows 7 Professional and without loosing my current installed applications, files, programs, and settings? Answer: Most netbooks computers can run other editions of Windows 7 just fine. 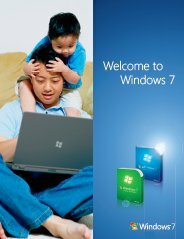 If you're interested in additional features of Windows 7 Professional then you can use Windows Anytime Upgrade tool to upgrade Windows 7 Starter edition to Windows 7 Professional on your Net-book computer in as little as 10 minutes, and it keeps your applications, files, programs and settings in place. Make sure that you have Windows 7 Professional product key ready. Windows Anytime Upgrade is only available for online purchase in the following countries: Australia, Belgium, Canada, France, Germany, Italy, Japan, the Netherlands, Spain, Sweden, Switzerland, the United Kingdom, and the United States. To make sure your netbook can run the advanced features in Windows 7 Professional edition, download, install and the Windows 7 Upgrade Advisor first. The Upgrade Advisor can help find potential issues and recommend what to do.